WHEN vegetation sprouts in a desert, it is a good sign; but when the ice in the Arctic and the Antarctic begins to turn green, there is something terribly wrong. There have been a spate of reports in recent weeks pointing towards a possible change in the shape of the Antarctic peninsula due to the breaking away of chunks of ice from the mainland. Similar changes are believed to be occurring in the cold Arctic, where plant life is spreading dramatically. The cause, some say, is global warming. But many others disagree. It all began with the British discovery that a large iceberg, approximately the size of New York city, has broken off from the icy continent. Then came the prediction by a group of Italian researchers that due to increasing atmospheric temperature over Antarctica an iceberg, measuring 2876 km may break off from the main bulk within 3 years. Debate snowballs This was followed by another significant development: the discovery, by an Argentine team, of a 40-mile crack in the northern-most part of the Larsen ice shelf, which runs 600 miles up the Antarctic peninsula. "We know that the 1st step in the melting of the west Antarctic ice sheet could be the destruction of the ice shelf", says Rodolfo del Valle, director of geoscience at Argentina's National Antarctic Institute. The cracking of the ice shelf, argues del Valle, is an even more worrying sign than the breaking away of the giant iceberg. The shelves guard the icecaps like plates of armour: remove 1, and the whole suit becomes vulnerable. It indicates that the Antarctic's ancient ice shelf has begun to break up in the warming seas. This threatens to destroy the barrier which prevents the continental icecaps from melting. These discoveries have also exposed fissures in the scientific community regarding the cause and effects of these developments. Some have argued that these are undoubtedly the most serious signs of global warming, but that there is nothing to worry about yet. "I have read about these findings in the newspapers, and it may be too early to comment", says A P Mitra, Bhatnagar fellow and a former director-general of the Centre for Scientific and Industrial Research. "From the preliminary details available so far, I am convinced that it is due to global warming. But I do not foresee a very grave risk", he adds. But some scientists say that this can have very serious implications, leading to the melting of the polar ice caps, which has the potential to submerge our coastal cities. Says geophysicist Charles Ebert of the State University of New York at Buffalo, "Without intact ice-shelves to cool them, the winds blowing over Antarctica will be warmer than usual. If they melt even a 10th of the continent's ice, sea levels across the world could rise by 3.65m to 6.09 m". There are still others who discount the role of global warming in the breaking away of icebergs and the appearance of the crack in Larsen's cap, and fail to understand how this can lead to any disaster. "None of these phenomena prove that global warming is underway. Each of them could be due to natural fluctuations", they argue. Glaciologists are convinced that the break-off has nothing to do with global warming, and that fears of a catastrophic rise in the sea level in the near future are unfounded. The are banking on the ruggedness and stability of the west Antarctic ice-sheet, a mass of 1.4 million cubic miles of ice around the South Pole, lying more than 1,500 miles to the south of the Antarctic peninsula, where the iceberg had broken off. Charles Bentley, a glaciologist at the University of Madison in Wisconsin, says, "Despite internal perturbations, this ice-sheet has evidently remained stable at least for the last 1,500 years". Even if the present slow rate of polar melting is increased 3 times, it would lead to just 1-foot rise in the world's oceans. Bentley further argues that so far there has been no sign of any warming of the air around the South Pole. In contrast to the peninsula where the giant iceberg broke off, and where the temperature has risen by 3.6 F in the last 40 years, the South Pole has actually got colder. David Vaughan of the British Antarctic Survey says, "Though the peninsula is warming much faster than the rest of the globe, this appears to be largely due to local causes such as the annual rate of the freezing of the sea during winter". There are not many takers for this argument. Researchers supporting the theory and logic of global warming contend that the "accumulation of such suggestive evidence leaves little doubt about global warming. If ever there is such a meltdown, our great-grandchildren will wish we had taken the warnings of climate change more seriously". Philosophy apart, there is a growing body of evidence indicating that the developments in Antarctica and the Arctic are due to global warming. But researchers differ on the exact impact of such a fallout. 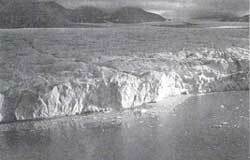 They argue that most icebergs are formed when glaciers fracture and slide off the land. But this particular iceberg in question resulted from the disintegration of continental ice-sheets -- traditionally considered to be permanent. Measurements in the Antarctic peninsula, says del Valle, "show that its average temperature has risen by over 2*C(degree centigrade) since 1930, with almost half the warming occurring in the last 30 years". The ice cap covers the continent like a giant wedding cake and is 6,000 feet thick on an average. "It contains 70 per cent of the world's fresh water resources; if all this melted away, it could cause sea levels to rise by 120-300 feet. Even a partial melt can prove to be catastrophic", he adds. Italian researchers point to "all signs indicating the heating up of the continental shelf, which may have dramatic consequences. Italian Antarctic Project engineer Mario Zucchelli argues, "We are not predicting catastrophes, but we must keep track of any major changes in the region". "Once the iceberg breaks off, sea currents will rapidly take it past the Malvinas island towards South America, where it will be a major obstacle to the busy shipping routes along the coast", Zucchelli adds. Indeed, it is such a complex situation that the real cause and its effects may be hard to predict immediately. Probably the only certainty about climate change is that we remain uncertain about the causes and its the impact pf the change on the planet and its inhabitants. But certain facts deserve consideration. Firstly, even without the latest evidence from the Poles, we know that every decade is growing warmer by 2/10th of a degree. As this continues, the regions which are already dry will continue to become drier. This will also, logically, have an impact on the polar ice caps. Secondly, even when the most alarming of predictions is made, the effect may not be felt until the middle of the next century, the more serious damage coming much later. Thirdly, we now have a growing list of possible implications of global warming, which need to be studied further. In a different but not unrelated research, scientists say that 130,000 sq km of the Pacific Ocean has lost 80 per cent of its zooplankton -- the microscopic organism near the base of the food chain, due to rise in water temperature. Similarly, the coral reefs from the Caribbean to the South Pacific sea are deteriorating -- apparently owing to warmer water, because the glaciers are on the retreat due to the decline in snow cover. These revelations came even while the 1st meeting of the Conference of the Parties (COP) to the United Nations Framework Convention on Climate Change (UNFCCC) was in progress in Berlin. It is ironical that some inhabitants of the affluent North found the concept of global warming difficult to grasp in the 1st shivery days of March. This is evident from the extreme reluctance of the US and Australia to discuss their commitments to reduce their carbon dioxide emissions to 1990 levels by the ad 2000. They failed to see that their reluctance was incomprehensible to the other participants in the Conference, when at the Rio Earth Summit in 1992, governments and industry had accepted the validity of the "precautionary principle" and "no-regrets approach" in drawing up policies aimed at checking the dangers of climate change. The developed North apparently feels that the final denouement of the carbon dioxide horror story is yet to be arrived at. Probably the scientific arguments and the developments in Antarctica and the Arctic are not scary enough for them. Or, probably they are waiting for something more terrifying that could propel them into recognising the imperatives of immediate action. But would the world have to wait until then?